1993 By the third year, we'd expanded to three rather crowded lots, still downtown. 1994 The only year it's rained all day - the city let us use every available parking space along all the streets of downtown. This turned out to be too spread out and the other shoppers were not exactly thrilled with the Corvette Parking Only situation. 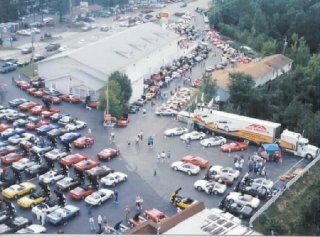 By 1995, it was clear there was no longer enough room anywhere downtown so we moved the car show to Pine Mountain Village, where there is room for about 600 cars. But the Vettes kept coming and, as shown in the 1999 photo at the right, even that filled beyond capacity. In 2000, we moved to The Great Passion Play grounds where we could fit over 1,000 cars. Beginning in 2002, we moved back to the paved parking and more "in the middle of everything location" at Pine Mountain Square. Today, Pine Mountain remains the site for our car show and the center of many other activities for the weekend. For 2018 ESCW had 382 cars registered. They came from 13 States.﻿ The top Three Clubs were: 3rd place - ﻿﻿Kansas City Corvette Association with 21 registered. 2nd place - Fast Glass from Jonesboro Arkansas﻿﻿ with 22 registered. 1st place went to Tulsa Vette Set﻿ ﻿with 54 registered.